Whoever accuses, publicly and against the facts, the Polish nation, or the Polish state, of being responsible or complicit in the Nazi crimes committed by the Third German Reich . . . or other crimes against peace and humanity, or war crimes, or otherwise grossly diminishes the actual perpetrators thereof, shall be subject to a fine or a penalty of imprisonment of up to three years. The bill was then rushed through the senate (57–23, with two abstentions) and quickly signed into law by President Andrzej Duda, of the Law and Justice Party (PiS), whose leader Jaroslaw Kaczynski has made the bill a key part of its nationalist program. 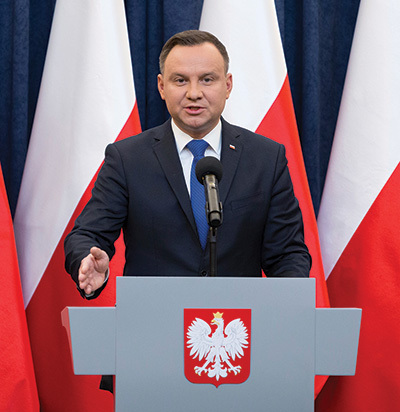 In fact, the PiS, which took power in Poland in 2015, practices historical revisionism as a constitutive element of its political strategy, and the new law criminalizing references to the involvement of the Polish Catholic population in the extermination of Polish Jews during World War II is only the latest episode in its efforts to falsify the past. The party does not have a distinct vision for the future, and it builds its legitimacy by claiming to rectify assorted wrongs that the Polish people allegedly suffered at the hands of “others,” including Germans, Russians, revanchist Communists, Euro-elitists, and Jews. “Poland is getting up from its knees” runs one of PiS’s most often repeated slogans—after the most prosperous and secure quarter-century in Poland’s history. The Holocaust law had originally been introduced and then tabled about a year and a half ago, after the Polish government had approved it. At the time Minister of Justice Zbigniew Ziobro described it as a big step forward in the “protection of the good name of Poland.” But over the past year and a half the government received voluminous feedback objecting to the deliberate simplification of the history of Poland under Nazi occupation. Yad Vashem, Israel’s Holocaust museum and research center, had criticized the law, as—it turned out—had the Polish Ministry of Foreign Affairs, as the recently replaced minister Witold Waszczykowski revealed to journalists. In the storm that ensued after the passage of this legislation—the U.S. State Department strongly objected and Prime Minister Benjamin Netanyahu flatly called it “an attempt to rewrite history”—Duda and other Law and Justice politicians feigned incredulity and outrage. What’s wrong, they have asked, with protecting Poland’s good name by making sure that people all over the world do not speak of “Polish death camps,” when, of course, camps such as Auschwitz, Treblinka, Belzec, and Sobibor were established by Nazis on occupied Polish soil? But had they merely wished to criminalize the use of the expression “Polish death camps” as a historical falsehood, they could have done so very easily. They didn’t—and it was not an oversight. Instead, the goal of this legislation was much more ambitious. Its aim was to falsify the history of the Holocaust in the service of a toxic nationalism. The Polish authorities want to gag any debate about complicity in the persecution of their Jewish fellow citizens by Poles during the war as a significant historical phenomenon. They propose to do so by criminalizing any mention of such complicity, which is “against the facts.” And, of course, they will be the ones who determine what the facts are. Given that there is an already ongoing crisis with the European Union over the destruction of judicial independence in Poland by the PiS, this is not reassuring. Although the new law specifically excludes those acting “within the framework of artistic or scientific activity,” in fact it aims to have a chilling effect on art, scholarship, and honest discussion more generally. 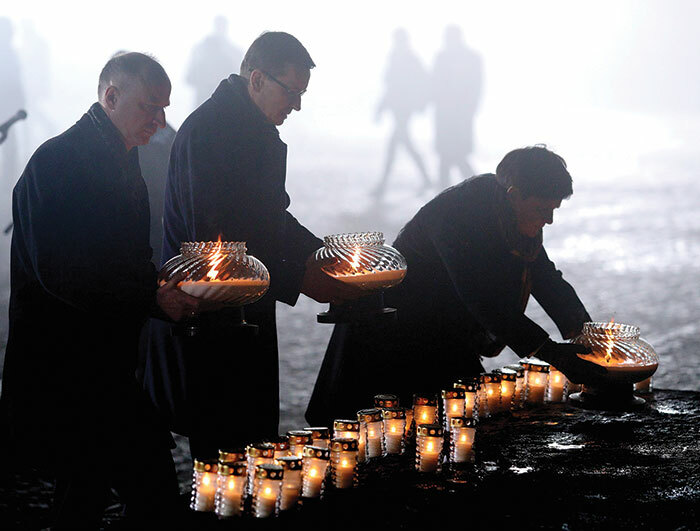 In particular, it aims to muzzle the extraordinarily rich and honest Polish historiography of the Holocaust produced over the last 20 years, which has provided the record of Poles’ complicity in the persecution of their Jewish fellow citizens. Moreover, under the letter of this law virtually every Jewish survivor of the Holocaust from Poland would have to be prosecuted. I’ve read many hundreds of survivors’ testimonies. I don’t recall a single survivor who—before he or she recounted finally finding a good person who had helped them—did not describe episodes of betrayal, or blackmail, or denunciation on the part of other Polish citizens. The day after the law was passed, the pages of Israeli newspapers were flooded with testimonies of the survivors and their family members, whose life stories had now been criminalized by the Polish government. When Israeli journalist Ronen Bergman asked Prime Minister Mateusz Morawiecki if he could be prosecuted for recounting his parents’ experience in Poland during the Holocaust, the prime minister responded, “You’re not go- ing to be seen as criminal [if you] say that there were Polish perpetrators, as there were Jewish perpetrators, as there were Russian perpetrators as well as Ukrainian perpetrators—not only German perpetrators.” The remark was not only ugly but telling in its deliberate bracketing of the Holocaust’s principal victims with Polish and other Eastern European collaborators. Under the pretense of defending Poland’s dignity and freedom to act as a sovereign country, the regime has played to the worst xenophobic and anti-Semitic prejudices of the public. Public television controlled by the Law and Justice Party stirs populist outrage by repeating that outside forces, and Jews in particular, want to prevent Poland from telling the truth about its own history, that extermination camps were set up and run by the Germans and not by the Poles—a fact no one denies. Not surprisingly, one can see the rise of anti-Semitic feeling throughout social media, in television, and in the pro-government press. The last time a Polish government used anti-Semitism in its official propaganda was half a century ago, in 1968, when the Communist Party waged its opportunistic “anti-Zionist” campaign in the aftermath of the Six-Day War. The ensuing ethnic cleansing led thousands of Holocaust survivors and their children to emigrate from Poland. Today, in a virtually mono-ethnic Poland, the PiS’s populism may well lead to the purging of the country of its future elites in all walks of life. A society mobilized around such mendacious propaganda will only grow more xenophobic, until the best educated, open-minded, and curious young Poles find their homeland an inhospitable place to live. Nowadays, as citizens of the European Union, it is an easy matter for young Poles to move and settle in another, more tolerant country. The long-term cost to the country’s social capital will be incalculable. The combination of these two threads: information about the crime on Jews in Jedwabne during the German occupation and the presentation of fallen soldiers of the independence underground is manipulation, an act to the detriment of the Polish nation. This is the paranoid PiS style in which a professed concern for historical accuracy is really its opposite. Deputy Justice Minister Michal Wojcik has been quoted as saying that he hoped the case would go to court. [A]s each generation rewrites national myths and calls back from the past collective experiences which have been shunted aside, I am optimistic that the subject of Polish-Jewish relations, once opened, will be revisited with honesty and sadness. But clearly Poland’s Law and Justice Party and its allies are capable of neither honesty nor sadness. Jan T. Gross is professor of history emeritus, Princeton University. His many books include Neighbors: The Destruction of the Jewish Community in Jedwabne, Poland (Princeton University Press) and Fear: Anti-Semitism in Poland after Auschwitz (Random House). The law evidently refers to the Polish "state" or "nation" which was in exile, as I understand it. That administration did not participate in any "holocaust" activities as far as I know and the law makes sense. The current brouhaha arises as a consequence of the reference to "Polish death camps" which is, in fact, a bad description. Poland did not exist and was then either "Germany" or the "General Government." Death camps existed in the General Government not in "Poland." 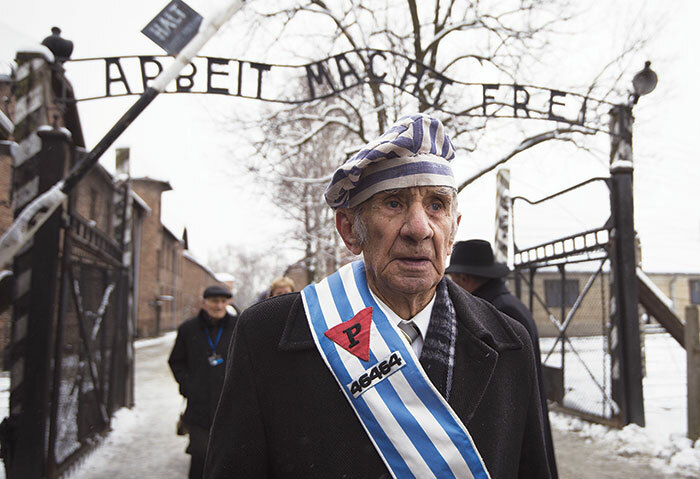 Did Poles participate in persecution of Jews? Sure, some did. Did Jews participate in persecution of some Poles? Probably. But this is all irrelevant. The only relevance is to once again place the "Holocaust" in the media now decades and decades afterwards because it serves the purpose of Zionists to always have "anti-semitism" front and center while they finalize their own solution by confiscating the property of Palestinians and liquidating their rights. Francesca Segal's prize-winning The Innocents: A generous, garrulous, and utterly genuine group portrait of Anglo-Jewry. In this season of repentance, it is not only the laws of the rabbis, but their stories as well, that teach us how—and how not—to forgive. Irving Kristol started off as a neo-Trotskyite and famously became the “godfather of neoconservatism.” But his idiosyncratic “neo-Orthodoxy” lasted a lifetime.